Welcome to "15 Eggs," where we bake extraordinary things on snow days. More like where my roommates bake extraordinary things and I help spread the calories. Really, I'm just trying to do my part. They should be thanking me, I've taken a lot of bullets for their sweet behinds. Today's menu consists of a freak cupcake. This cupcake was probably made fun of in high school (but will inevitably be rich, like all cupcake freak highschoolers are). It probably has a hard time finding jeans that fit right. It probably feels like there's no where it belongs. That no one could ever love it. My poor (not-s0) little freak cupcake, if only it knew how much it was loved. If only it knew that it always has a place in my heart. And my tummy. Brigitte Dale, my favorite video blogger on youtube loves cupcakes. If she knew who I was, or was my friend like I pretend that she is, I would totally have baked this crazy cupcake for her. But she doesn't know me. And we are not friends. Not even a little bit. Therefore, this cupcake is a challenge that the 15 Eggs girls will have to face on their own. 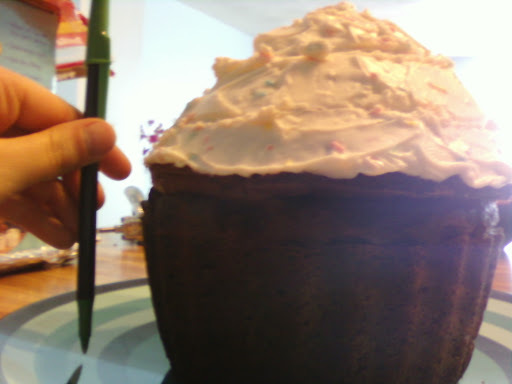 Well now I know who you are :) Love the massive freak cupcake!